UC Santa Cruz History of Art and Visual Culture Professor T.J. Demos, director of the new Center for Creative Ecologies. 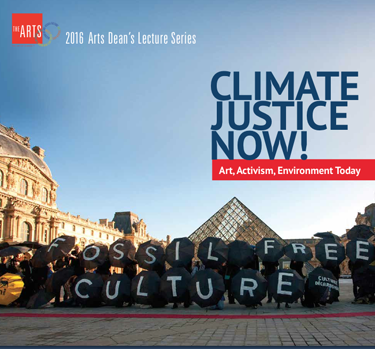 Climate Justice Now!--Art Activism, Environment Today is the title of the 2016 Arts Dean’s Lecture Series--an array of free public talks running March 30 to May 25 at UC Santa Cruz. The series is presented as part of a course taught this spring quarter by history of art and visual culture professor T.J. Demos, who is also director of the new Center for Creative Ecologies. “As climate change threats grow more severe, and in the absence of government leadership, artists and activists are inventing creative strategies of consciousness-raising, mass mobilization, and ecologically sustainable thinking and living,” Demos noted. 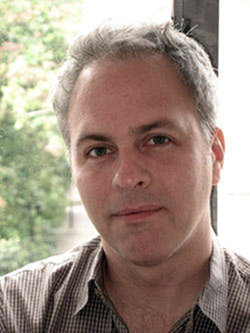 Demos said that the goal of this year’s Arts Dean’s Lecture Series is to introduce both students, and the general public, to the present convergence of artists and activists now addressing climate change. Some skeptics might say the arts really can’t have a significant role in dealing with climate change--that it’s really the realm of scientists. But Demos has a different take. He believes that cross-disciplinary conversations are essential in a rapidly changing world in order to share knowledge and build intellectual resilience. “There are many advantages to be gained from posing humanities and artistic-related questions to scientists, including the ethical implications of research, how it revises our shared conceptions of what it means to be human, and how we might relate responsibly to the web of life beyond ourselves,” said Demos. For a complete schedule of speakers and their backgrounds, visit the Arts Division event web site. The 2016 Arts Dean’s Lecture Series, Climate Justice Now!--Art Activism, Environment Today, takes place March 30 to May 25 at the Media Theater in the Theater Arts Center on the UC Santa Cruz campus. All lectures begin at 5 p.m. Admission is free and the public is invited. This event is sponsored by the UC Santa Cruz Arts Division and the Arts Dean’s Fund for Excellence. For more information, go to http://arts.ucsc.edu/lectures/dean-lecture-series-2016.